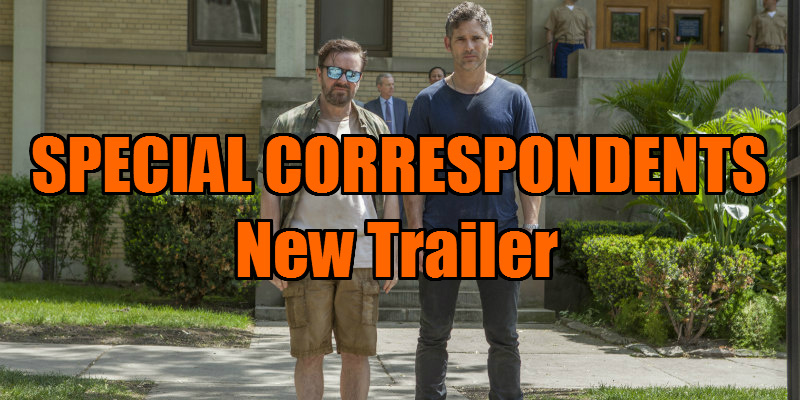 Ricky Gervais has released a new trailer for his new movie Special Correspondents, which will premiere exclusively on Netflix on 29th April. Ricky Gervais and Eric Bana star in Special Correspondents, a Netflix original feature film written and directed by Gervais. Bana plays Frank Bonneville, a charismatic New York based radio journalist whose arrogance and decadent lifestyle has hindered his career. With his job on the line, Bonneville is dispatched to Ecuador along with his hapless technician, Ian Finch (played by Gervais), to report on a potential rebel coup. On arrival at the airport, Finch realizes he has mistakenly thrown away their passports, tickets and money, and the two hatch a plan to fake front line reports from the comfort of their hideout above a Spanish restaurant in Queens. As their reports on the conflict escalate they become a national sensation, captivating the hearts of listeners across America, which leaves them having to sneak into Ecuador for real in order to untangle their web of lies.